The name derives from a traditional Scottish song. The 1880s photos show a single storey corner building. In November 1888 architect Sydney Smith invited tenders for the pulling down and re-building of the Laird ( Building Engineers and Mining Journal 17 Nov 1888, supplement 7) . The hotel was bought by the Burton Brewery, and then in 1912 Carlton & United Breweries acquired it. 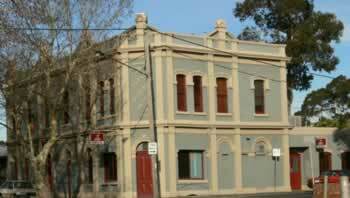 The current building is brick, two storeys, with neo-classical detail and facade treatment. The brickwork has been overpainted, and ground floor windows and doors have been altered. But favour wi' wooin' was fashious to seek. And wha could refuse the laird wi' a' that?